Gene Baur, a friend and fellow marathoner, is what you might call the activist's activist. He's articulate, charismatic, and a rare blend of incredibly friendly but serious at the same time. The range of his activism runs the gamut. 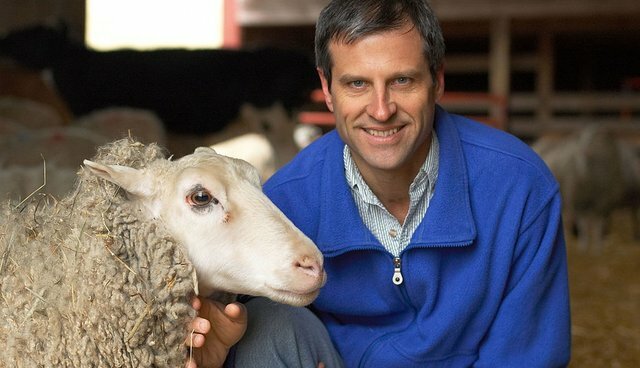 He travels relentlessly to give talks about his work at Farm Sanctuary and the benefits of living a compassionate "animal-friendly life" (in fact, when I first met Gene he was rambling through town in a VW Bus on a cross-country tour promoting veganism); he lives out his ideals by rescuing and raising farm animals at the nation's leading farm sanctuary that he founded in the late 1980s; and, to top it off, he is a best-selling and elegant writer - author most recently of "Living The Farm Sanctuary Life," which is just out. Gene's book is a rare combination of attributes. It's a strong plea for a plant-based diet, a guide to animal-friendly consumer and environmental ethics, an overview of farm-animal sentience, and a range of recipes that help us put our values on the plate in an especially delicious way. My favorite recipe section is "handheld meals"- and the Just Mayo chickpea salad sandwich (p. 164) has become a go-to (in fact, it'll be my lunch today). What comes through powerfully in this book is the inspiring notion that - and I admit to doing battle with this idea - individual choice matters when it comes to creating a better world for animals. "I believe that everyone can make a significant change in their lives when they're ready to make that change," Baur writes. Don't let the simplicity of the statement fool you. After reading this book, even the most worn skeptic will be softened to the possibility. If all this sounds too good to be true, you can check Gene out for yourself. This evening he'll be on "The Daily Show with Jon Stewart." Tune in. This article originally appeared on James-McWilliams.com.